In today's fast track music world there is certain section of the audience who still likes the traditional Indian Classical Music and always remains in search for such a programme fulfilled with contemporary traditional music. 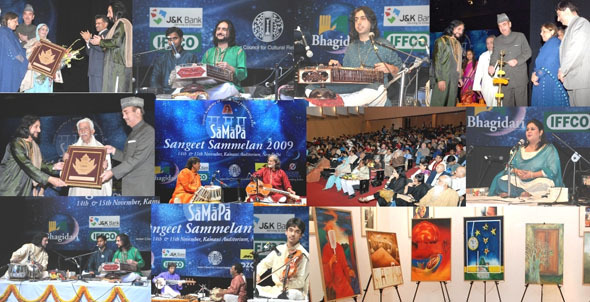 In the world of Indian Classical Music one of the most talked about festivals is ‘SaMaPa Sangeet Sammelan’, which with its modern presentation fulfilled with glory, glamour and jam packed auditorium creates buzz amongst the audience while maintaining the tradition and culture of the country. Within the last four years SaMaPa Sangeet Sammelan has become the premium and most prestigious festival of Delhi and ranked amongst the topmost festival of the country. SaMaPa is a prestigious platform for the young talented musicians to present themselves along with the stalwarts of Indian Classical Music. The annual festival by SaMaPa was organized recently at Kamani Auditorium, New Delhi. SaMaPa is more than an academy and is a cultural movement aimed at propagating and popularizing Indian Classical and traditional music and other performing arts for which it is recognized on a global level. SaMaPa is acclaimed as a cultural bridge of the state of Jammu and Kashmir and rest of the country. The two day music festival with three sessions started with a soulful Sufi vocal recital by young Sufi diva Ms. Ragini Rainu. Ragini presented 2 composition of Baba Bule Shah 'Ki Bedarda Sang Yaari...' in Raga Mishra Kaafi & 'Utth Chale Gawando Yaar...' composed by Pt. Bhajan Sopori in Raga Bairagi. Ragini was accompanied by Sh. Akhtar Hasan (Tabla), Sh. 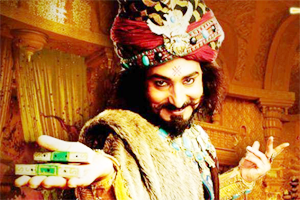 Ahsan Ali (Sarangi) and Sh. Sajjad Ahmed (Harmonium). After that renowned Santoor player & music composer Sh. 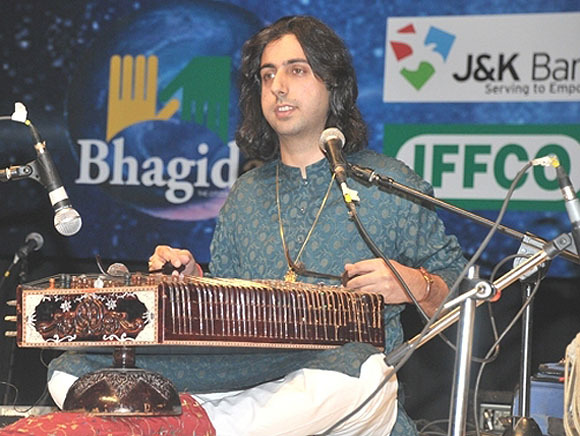 Abhay Rustum Sopori's Santoor recital enthralled the audience. Abhay is known for presenting tough ragas and Taalas. He appropriately selected Raga Gawati which has a major stress on ‘Sa, Ma, Pa’, which also happens to be name of the festival ‘SaMaPa Sangeet Sammelan’. Abhay commenced his recital with Raag Gawati presenting Aalap-Jod, Pancham Sawari Taal in 15 beats, Bandish in teentaal 'Aangan Aao Balma...' and concluded with Fast Jhala in Teentaal. He was accompanied on Tabla by Ustad Rafiuddin Sabri & Sh. Sarit Das. After Abhay, son of renowned violinist Dr. L. Subramaniam - Sh. Ambi Subramaniam presented various compositions in Chaartaal and represented the dimensions of Mridangam, Tabla & Morsing. His performance was soulful which showcased the talent of an upcoming artist's passion for music. He was accompanied by Ust. Akram Khan, Sh. VV Ramana Murthy and Sh. Satya Sai. Earlier while inaugurating the festival, Sh. Ghulam Nabi Azad, Honb. Minister for health and Family welfare, congratulated Pandit Bhajan Sopori for presenting this festival which has become a part of the country’s cultural calendar and providing people with his musical balm. He appreciated the works of SaMaPa and the efforts of the great Master Musician Pt. 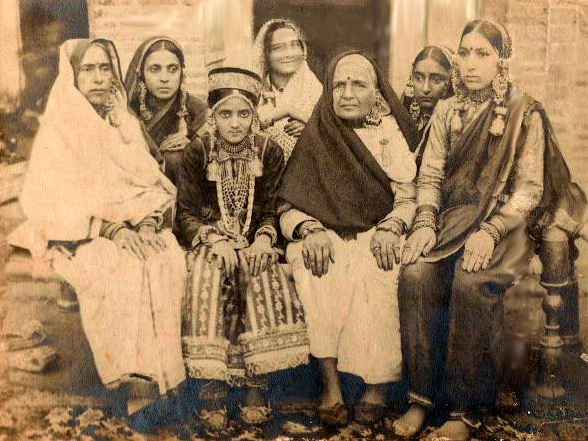 S. N. Sopori (hailed as the father of music in J&K) and later Pandit Bhajan Sopori in reviving and revolutionizing the cultural scenario of the country in general and State of J&K in particular. The second morning started with the famous theme based programme of SaMaPa ‘Swar Laya Samvad’. The theme for this year was ‘Sangeet Mein Sahitya’ (essence of literature in music) featuring vocalists Sh. Shantanu Bhattacharya & Sh. Devashish Dey. The programme was presented by Pt. Vijay Shankar Mishra. The recital presented various forms of Raga Todi namely - Miya Ki Todi, Gujri Todi, Desi Todi, Bilaskhani Todi & Salagvarali Todi. The morning session concluded with what can be called as the main attraction and highlight of the festival - Santoor recital by music legend Pt. Bhajan Sopori who was accompanied on Tabla by one of the foremost Tabla maestro of the country Pt. Kumar Bose. They both mesmerized the audience with their performance. Pt. Bhajan Sopori commenced his programme with a rare Raga Bheem presenting Aalap, Jod, Jhala, Vilambit Teentaal, Madhyalaya Ektaal followed by Drutlaya Teentaal. It was a historic moment as two of the senior most artists performed at the same time. Their Chandkari & Layakari was a treat to the music lovers. The second evening started with a Sarod recital by Sh. Amaan Ali Khan who presented Raga Yaman Kalyan starting with Alaap  Jod and compositions in Jhaptaal, Ektaal, Teentaal & concluded with small compositions in Raga Des and Charukeshi. He was accompanied by h. Mithilesh Jha on Tabla and Sh. Fateh Singh Gangani on Pakhawaj. Later Ustad Mashkoor Ali Khan present Raga Bihag & Bandishi Thumri. He was accompanied by Sh. Nisar Ahmed on Tabla and Sh. 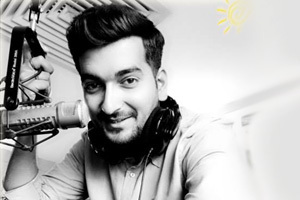 Asif Ali on Sarangi. The two day program ended on the splendid note with the performance by Pt. 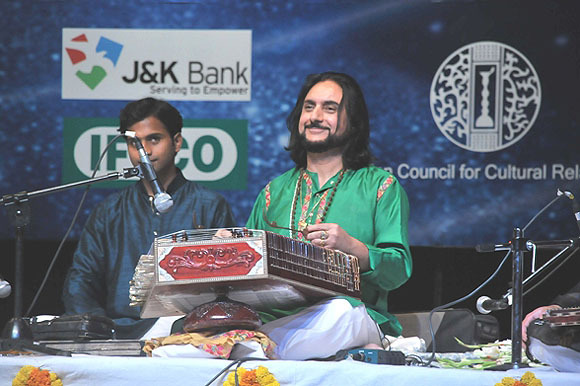 Vishwa Mohan Bhatt, who along with Ram Kumar Mishra mesmerized the audience, Pt. Vishwa Mohan Bhatt presented a rare raga  Hem Khem of Mahiyar Gharana. Sh. Munish Jolly ably anchored the festival. The festival was presented with support of Delhi Govt, ICCR, IFFCO, J&K Bank, Ozone Group, JK Tyre, and BSNL. The festival also featured a painting exhibition by SaMaPa in collaboration with J&K Academy of Art, Culture and Languages presenting the artist of Jammu and Kashmir. This is a regular feature by SaMaPa in all its festivals to present all forms of art together especially promoting art and artists of J&K. During the two day program, for the outstanding achievements and contribution to Indian Classical Music renowned Violinist Dr. L. Subramaniam & 'Mahant' (Prof.) Veer Bhadra Mishra (Varanasi) were honoured with the prestigious ‘SaMaPa Vitasta Award 2009’ which carries a cash award of Rs. 50,000, and Smt. Raj Begum was awarded the 'SaMaPa Sher-e-Kashmir Sheikh Mohd. Abdullah Award 2009' which carries cash award of Rs. 25,000, for her lifetime dedication and contribution in the field of Kashmiri. Apart from these two awards this year SaMaPa has introduced a special award named 'SaMaPa Acharya Abhinavgupt Samman' which will be given to music critics, scholars and journalists in appreciation of their extraordinary work in the field of art, culture and languages. This year the award was conferred upon 3 eminent music critics from Delhi - Sh. Ravinder Mishra, Pandit Vijay Shankar Mishra and Smt. Manjari Sinha. The annual function saw the presence of who's who of various fields like Sh. Ghulam Nabi Azad (Honb. Minister for Health and Family Welfare), Smt. Shameem Azad, Smt. Aparna Sopori, Sh. Virendra Gupta (DG, ICCR), Sh. Zafer Iqbal Manhas (Secy. J&K Academy of Art, Culture and Languages), Sh. Dinesh Rai (Secretary Micro, Small and Medium Ent. ), and various eminent musicians of the country like Ustad Amjad Ali Khan along with wife Subhalaxmi Khan, Smt. Shanno Khurana, Pt. Rajan-Sajan Misra, Ustad Ghulam Sadiq Khan, Smt. Uma Garg. Others who graced the occasion included Sh. S.C. Sehgal (Chairman OZONE), Sh. Ghansham Das (GM IFFCO), Sh. Sanjay Sharma (GM JK Tyre), Sh. Veer Munshi (Artist) and many others.